In the midst of my pink eye adventure, I told you that I had to order some new makeup since I had contaminated my other products because of my infection. 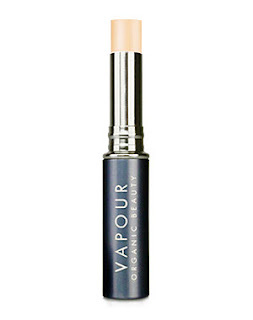 I've had the chance to try everything new I ordered, so today I would like to share my thoughts on one of those new products: Illusionist Concealer by Vapour Organic Beauty. May I make a confession? When it arrived, I had buyer's remorse. I opened it up and saw how DARK color 030 is. I was ticked that I listened to all the reviews of going a couple shades darker. Not with my PALE skin! I thought I'd have to ship it back to beauty.com and try a lighter shade. And when I first saw it, I said, "Why on earth did I just spend $22 for a concealer?" Well, shock of all shocks, I can be W-R-O-N-G. Yes, as much it pains me to admit it, this girl ISN'T always right. I have been using this concealer for a little more than a week and this is really, truly holy grail material. First of all, you need SUCH A TINY AMOUNT of this concealer because it is so nicely pigmented that this will last longer than other formulas (my usual go-to seems to be chronically out of stock--that was the concealer with the wand from 100% Pure). Color 030 is PERFECT for me. I usually get the lightest neutral/warm concealer shade available and while it does LOOK dark in the tube, it is a great match once applied. I love how this is in a lipstick type tube. The consistency is FABULOUS. I generally use a concealer brush to apply my concealers, but I use my finger and very gently dab it in for blending. It genuinely works amazingly well on dark circles. After we all were sick in this house and with lots of writing projects, I have been EXHAUSTED lately and it shows! The dark circles are nearly invisible with this concealer. The texture is amazing. It isn't too moist and slippery, nor is it too firm. It is perfect. And how often does this sometimes overly critical blogger use the word perfect? One of my biggest concealer pet peeves is that my sensitive eyes get irriated. Usually, by the end of the day, my eyes are sore because the concealer has somehow migrated a bit too close to my eyes. This doesn't happen with Illusionist from Vapour! This concealer DOES NOT accentuate or settle into fine lines, making it great for those who aren't 19! I can honestly say that this is the best concealer for the undereye area that I have used since I started needing a concealer for my dark circles. This is the best product I have ever purchased after having buyer's remorse, too! I give this an A+. If I issued A++++++++++++++ as a review grade, it would get that. Vapour Organic Beauty Illusionist Concealer is fantabulous!